Makapuu Beach, where the change in sea level and erosion have visible impact. In 2018, Hawaii’s local government adopted a strong stance to protect our islands from effects that residents have already been experiencing. Local communities are unique in that mayors are enacting coastal guidelines as official policy, which is a forward-thinking move that many other coastal communities are not doing as of yet. While many local and state-level governments do not have official positions on the effects of global warming, sea level rise, and their effects on their respective areas, the state of Hawai’i has officially released the Hawai’i Sea Level Rise Vulnerability and Adaptation Report. This report outlines in no uncertain terms the projected and measurable consequences of sea level rise for our state. The report posits that seas will rise by over one meter by the end of this century. Even more recent official projections have stated that this may even be a low estimate. Hawai’i, and any island community, has clear and unique challenges in facing rising sea levels and in dealing with adverse disaster conditions. Due to our unique location, temperature- and ocean-dependent weather patterns, and isolation from mainland resources, Hawai’i is particularly vulnerable to the repercussions of the evolving global environment. Infrastructure here has been developed to work with the ocean as it was several decades ago and many of our waterfront housing or fortifications, harbor facilities, sea walls, and beaches etc. are now degrading under today’s ocean conditions. As a Hawai’i-founded organization, Oceanit understands both the cultural and engineering challenges these shifts pose to our islands. Our team is focused on mitigating coastal concerns for our islands responsibly. These solutions and thought processes can be extended to assist more coastal regions as well. We believe in working towards a sustainable future for Hawai’i, and the whole planet, through responsible and innovative engineering solutions. Inundation is the base of SLR; where a higher ocean level will lead to more powerful waves, larger storm surges, and increased damages due to wave height that we are so far unprepared to handle. Erosion will negatively impact us beyond the obvious pushing back of physical shorelines and reduction of usable land. Fine sediments affect water quality which impacts reefs and continues to contribute to the global warming/SLR/erosion cycle. Salt intrusion can cause issues in certain locations and micro ecosystems that are normally not high in salt, such as wetlands, coastal groundwater, and low land plant life which includes Hawaiian specific agriculture such as rice and taro. Rising groundwater tables are both caused by and lead to severe drainage issues, and can lead to larger and more frequent flooding and decreased drainage where needed. This makes high-rainfall areas near the coast particularly susceptible to post-storm damage above and beyond what has been seen previously. So what can we do as both residents and engineers? Oceanit’s RiSE team is committed to enacting responsible engineering solutions to mitigate these adverse effects. We understand that over-engineering our natural environment isn’t the answer. We deliver innovative, responsible, effective, and sustainable infrastructure to communities and ecosystems – solutions that are capable of surviving and functioning under chronic stress and recovering quickly from extreme events. We focus on four main concepts for mitigating rising sea levels and climate change, all of which are used in combination dependent on specific scenarios. Armoring is one of the more straightforward models of protecting the Hawaiian Islands from rising waters, but is not always the right solution for our Aina (Land). Coastal armoring has become incredibly common in the continental United States, and includes things like sea walls, bulkheads (vertical walls that retain soil but provide little protection from waves) and revetments (sloping structures on banks and cliffs). To that point, "fundamentally, there is an issue with the concept of building walls to stop flooding," says Rachel Gittman, an environmental scientist and ecologist at East Carolina University. "We should not be thinking that we can stop every flood." Oceanit’s Dr. Mike Foley agrees that armoring is not a permanent solution at the current rate of sea level rise progression. “We can dedicate…planning and research to (armoring) in order to have more time to perfect moving out or retreating,” says Dr. Foley. 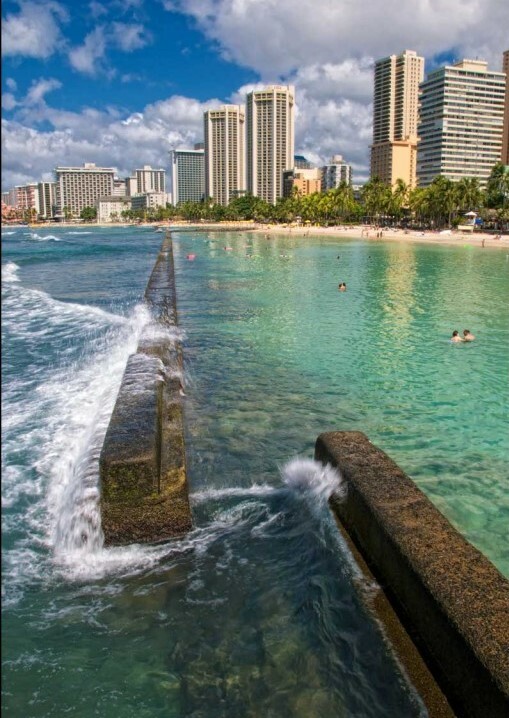 Coastal armoring structures are not always appropriate for Hawai’i specifically as they alter the natural beauty of our islands and could fundamentally alter the way we enjoy certain coasts, beaches, and waterfronts. Adaptation methods are discussed as a more viable option when paired with strong worldwide actions to lower environmental damage, but without a strong and consistent commitment to these actions, land reclamation is a temporary fix. Reclamation could act as a stay to create additional time to plan and implement more permanent solutions. 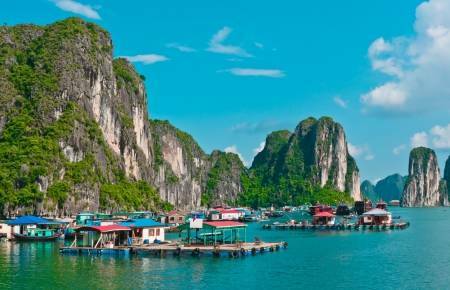 Moving out to sea is a concept most commonly seen in southeast Asia, and one that most closely works with the ocean instead of against or in spite of sea levels. Putting communities and infrastructures on top of the water is one seen in sci-fi films like Water World or in travel blogs and videos of areas like Thailand and Vietnam. While Dr. Vithanage argues that moving out to sea is the most reasonable action in his opinion, he also holds a positive outlook on the time and resources still available to us. “Time is still on our side to plan… small houses and structures can be raised,” along with the creation of protected lagoons and levees that protect the shoreline while still maintaining some of Hawaii’s beach-based tourism. Oceanit engineer Grant Tokumi believes, “the history of the islands is clear… historically the only option we have is retreat [inland].” He noted that the shore is our first line of defense and believes in a concept of temporary coastline armoring to allow us to retreat over time and protect core infrastructure. The option of retreating immediately is not a viable option for obvious reasons: rebuilding a complete infrastructure with an anticipated future shoreline in mind would never gain widespread acceptance from landowners and policy makers. However, the long-term nature of this option makes it a much more feasible course of action over time. As Grant Tokumi assures, “this is not a 20 year happening that we need to get all done right away... this is a 200 year happening.” The true implementation of retreating means making conscious decisions from now on with an inward moving shoreline in mind: as buildings and roads naturally require repairs and replacements through age or damage, we need to begin the process of moving them further inland and making plans to condense infrastructure more centrally on the island. Some recent additions to Hawaii’s infrastructure have taken these first steps- a contact from HART (a company related to the Oahu rail project) has disclosed that the rail system was planned not with the current coastline in mind, but with a future shoreline at approximately King/Beretania streets. Building new infrastructure or dedicating resources to repairing anything seaward of future shoreline projections should only be done with the long-term objective of moving inland in mind. The scientific and engineering community as a whole is in constant discussion about the pragmatism and feasibility of each potential engineering solution to sea level rise. We believe that no one solution is the be-all end-all for any particular instance of location, and this is especially true for the islands of Hawai’i. Oceanit agrees that the unique culture and ecology of Hawai’i creates some more intense issues than those of coastal communities in the continental United States and worldwide.We believe in action for property owners on a smaller scale, including the use of industrial sandbags and backfilling under seawalls, while larger, long-term plans are being put together at a public policy level. Oceanit maintains a consistent, open dialogue both internally and in our community about the challenges presented by sea level rise. All of our scientists and engineers cross-pollinate their ideas to deliver innovations and solutions that will make a difference within Hawai’i. The consensus among our team is that every idea is worth listening to, incorporating, and evolving. No idea is off the table; when you bring together interdisciplinary innovators that live and work in Hawaii, the group effort will be beneficial to everyone on our island. Oceanit believes that no single response is going to be the one solution appropriate for the entire state. Every coast on every island has different topography, different existing infrastructure, and different intrinsic value that will alter the approach that we take to protect and preserve the land that currently exists. Our intent and hope is that, in addition to evolving with our community, the ecological and engineering innovations that Oceanit implements will be used across the globe. We can help prove that Hawai’i is key in leading change and developing new technologies as an example to be followed. The many symptoms of climate change are situations that Hawai’i must approach differently from the continental United States, a task that Oceanit has a long history of tackling and intends to continue in the future.